Trauma is one method of examining how changes in political, economic or social systems are felt in the people who lived during these eras. Cultural and environmental shifts can change the way that people interact with one another, causing an increase or decrease in violence, either within groups or between them. This can be easily seen in modern society, where changes in central authority and power have caused violence throughout the Middle East and Northern Africa. In order to make the results of analysis of trauma valid, one needs to also examine the violence in other periods for comparison. By comparing our knowledge of general shifts in political, economic and social spheres against trauma from the skeletal remains we can begin to better understand one way in which the general people would have felt the changes. A new study by Slaus et al (2012) from the American Journal of Physical Anthropology investigates the hypothesis that there was increasing deliberate violence throughout time in the Eastern Adriatic. In order to test this, they examine skeletal remains from the antique (2nd to 6th c. AD), early medieval (7th to 11th c. AD) and late medieval (12th to 16th c. AD) periods in Croatia. Available historical documents argue that the antique period was fairly peaceful except for a single Visogoth invasion. Violence increased throughout the early medieval period as Croatian rulers clashed against the Byzantine Empire for control of the Adriatic coast. This is eclipsed by large scale violent outbreaks in the late medieval period caused by a weakening central authority and the intrusion of the Mongols and Ottoman Turks. This narrative of increasing violence can be tested against the prevalence of trauma in skeletal remains. If there is a corresponding increase in the frequency of trauma, it could indicate that not only is the narrative correct but that it had widespread effects on the people. The sample includes 1125 skeletons from 10 different sites dating to the three periods. The antique series includes 346 individuals from two urban sites. The early medieval series includes 313 individuals from four rural sites. Finally, the late medieval series includes 466 individuals from two urban and two rural sites. The division between rural and urban communities is potentially problematic since rural populations have higher frequencies of trauma in general due to the greater risk of injury associated with farming. However, these work related injuries appear in specific areas and patterns, and can be discounted from the study. Bias can also be introduced since males are more likely than females to engage in high risk activities that cause trauma. Only adults, individuals over 15 years, were analyzed. In order to examine trauma only, the researchers focus on skeletal indicators of direct violence. These include perimortem injuries, sharp force trauma, parry fractures and craniofacial fractures. Both macroscopic and CT scans were used to assess the extent of the injury. The recorded the presence of the four types of trauma on singular bones, including the clavicle, humerus, radius, ulna, femur, tibia, fibula and craniofacial bones. For long bone fractures only, in the antique period, approximately 1.2% of bones had signs of deliberate violence, with males and females at equal levels. However, in the early medieval period males display 2.2% violent trauma and females only have 0.5%. This trend continues with similar percentages in the late medieval. 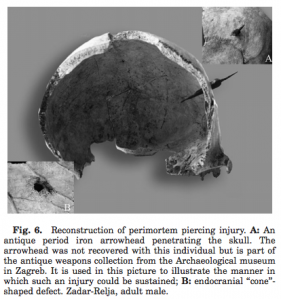 Craniofacial fractures were found on 16% of the antique series, 15% on the early medieval, and 20% in the late medieval. Males have higher frequencies of these types of fractures in all periods. For all types of trauma in all three periods, the frequencies were highest among the older individuals (over 30 years old). The skeletal evidence supports the historical hypothesis that violence increased over time in this region. 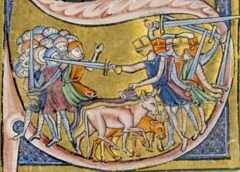 The researchers do note that the rise in feudal anarchy and conflicts between different groups doesn’t necessarily mean that it was these events that were the cause of the violence. Correlation does not equal causation. They note that it is equally as likely that the violence found on the bones was a cause of increased risks associated with changes in lifestyle rather than a direct effect of increased warfare. The higher prevalence of trauma in males could be associated with increased likelihood of their involvement in conflict, but also may be due to the higher fracture risk and more physical demanding jobs that they would be performing. Overall the analysis done by Slaus et al (2012) is quite fascinating and deals well with the many problems of doing this type of analysis. They address many of the issues that they could be critiqued for, including the correlation not causation problem that often occurs, the problems with determining accidental versus violent trauma, and the sample issue of the rural and urban populations. However, the presence of all these issues leaves us with no real conclusion or strong interpretation. In the end, the increase in trauma may not have any relation to the historically documented rise in violence. Perhaps future studies will have more comparable populations that will allow the hypothesis to be directly tested.